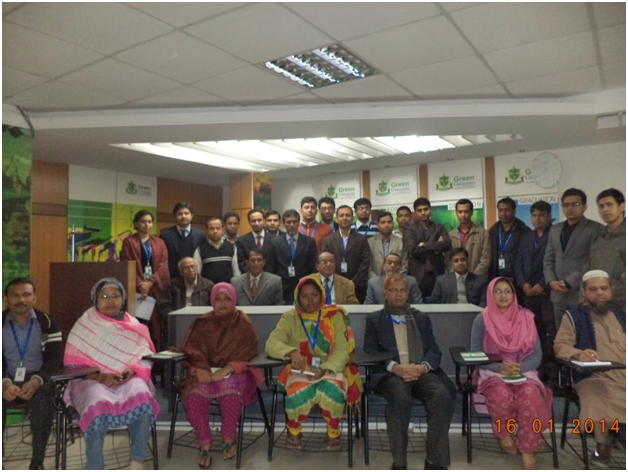 Green University of Bangladesh (GUB) has launched Communicative English course for its administrative staff as a continuous professional development initiative on 16 January, 2014 at the Green Auditorium. Designed by the Language Center, this course is based on real language, as used day to day. It is rich in useful vocabulary, and expressive and active fun. It is offered to the staff with a view to help them connect with others, to communicate in real situations, to talk about their own experiences, to express their emotions, and to learn from one another. As a part of the colossal plan to establish English as the campus language in future, this course is offered to make all GUB administrative staff proficient in English, especially in verbal and non-verbal communication so that they can converse well with their peers and others in English without any difficulty. After completing this course they will hopefully be able to speak, read and write in English well. The course will formally start from 20 January, 2014 and last for 12 sessions through the Spring Trimester. Prof. Dr. Md. Golam Samdani Fakir, Vice Chancellor of GUB and chief guest, inaugurated the launching ceremony of the course with his inspirational views on the importance of English as a second language. Mr. Shahidullah, Treasurer, Lt. Col. Md. Ali Ambial Haque (Retd. ), Registrar, and Professor Ahsanul Haque, Chairperson of the Department of English, graced the occasion as the guests of honor. A.S.M. Shamim Miah, Assistant Professor of English and Coordinator of all the GUB Centers, provided overall guidance. The course, along with all the four modules of English language teaching, will cover topics like social capital for classroom, leadership and administrative skills, instructional skills, counseling skills, across culture communication, team playing, effective habits of high performing administrators, problem solving, efficient use of PowerPoint, etc. The course will conclude through an array of assessments in the second week of April, 2014.